As someone who grew up watching Naruto and is currently binging on My Hero Academia, I have a deep appreciation for the Shonen genre of anime and manga. With a great amount of action, there are tons of series that I adore. I do love the new stuff that comes out, but with so many series in this genre, I do feel like sometimes the works overlap one another. 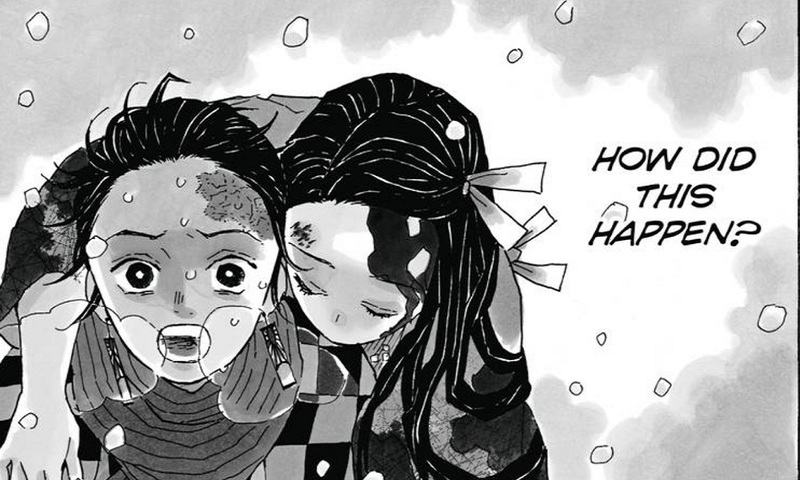 The first volume of Demon Slayer: Kimetsu no Yaiba is a promising start for a new series, but does fall into a formulaic plot and inconsistent tone at times. If this reminded you of Naruto or any previous Shonen series, I wouldn’t blame you; overall, I found the plot of Demon Slayer: Kimetsu no Yaiba highly derivative of other fantasy action series out there. As it stands, Tanjiro reminds me of the young, inexperienced apprentice with a tragic backstory that wants to overcome his shortcomings in order to save his sister. Most of the plot relies on regular Shonen tropes, and while it does work, I couldn’t help but compare it to better series throughout my time with the first volume. That being said, the first volume is entertaining enough to recommend, albeit slightly. Tanjiro’s tragedy is visceral and saddening, and he’s someone you’d want to root for. While he does feel like a generic Shonen protagonist, he’s still weak yet crafty in his first few battles, with the his only real super ability being super smell (at the moment). I’m excited to see how his character develops, even as the story feels like a run-of-the-mill plot. There hasn’t been a main villain established yet, but the staggering amount of demons introduced is currently more than enough for our stalwart hero. The biggest problem with Demon Slayer is the oddly inconsistent tone. I would have appreciated this volume more if stuck to its serious roots and was a more mature take on the demon extermination plot, but there are just way too many instances where the story veers into light-hearted comedy territory, whether it be the naivete of Tanjiro or a bumbling lesser demon that almost went and killed the main protagonist. Demon Slayer is trying to emulate the action/comedy balance of early Naruto, but due to the subject matter, would have been better if it stuck to the action segments. The art style also reflects this, as most panels are drawn with a horror-esque atmosphere in mind (after all, demons are a deadly threat). Making a humorous quip about an enemy losing its body rips out all tension in the situation, and unfortunately lessens the emotional impact in some of the manga’s moments. For what it’s worth, however, the action scenes are worth reading the first volume for. I especially liked the scenes near the end of volume with the final selection for prospective demon slayers as it puts Tanjiro in a seemingly hopeless situation but advances the plot along while cementing him as the hero of the story. The first volume of Demon Slayer: Kimetsu no Yaiba is a serviceable Shonen manga with an inappropriate balance between action and comedy. While it does have numerous shortcomings, it does have potential to be a rather good action series in the future.